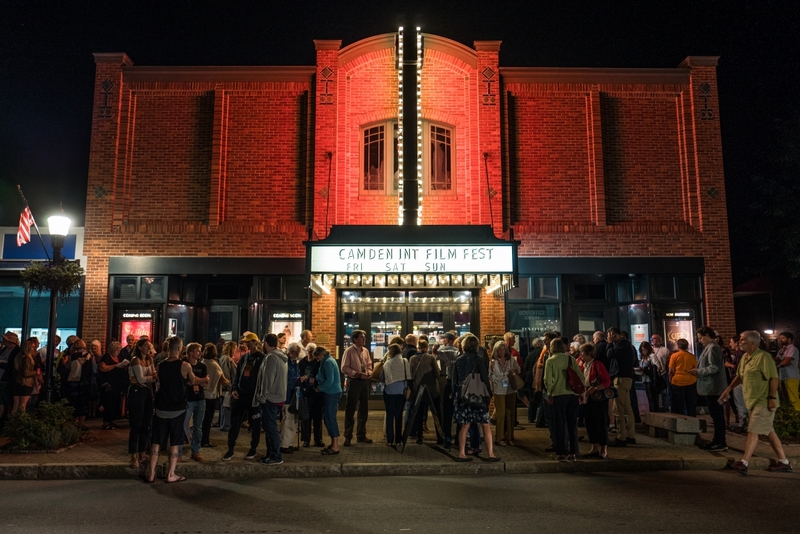 For 14 years, the fall season has meant, for me, the Camden International Film Festival (CIFF) in Camden, Rockport and Rockland, Maine—three picturesque small towns nestled between the mountains and the sea, just 17 miles south of where I grew up. Camden specifically has long thrived as a gathering place for the meeting of the minds, away from it all and in an environment that naturally encourages inward contemplation and a shedding of social trappings and pretense. Since 1988 the Camden Conference has lured foreign affairs experts to brave the harsh Maine winters to discuss pressing issues of our time, and later this fall, PopTech will host its 22nd annual conference, bringing together emerging and established leaders and thinkers challenging the status quo. 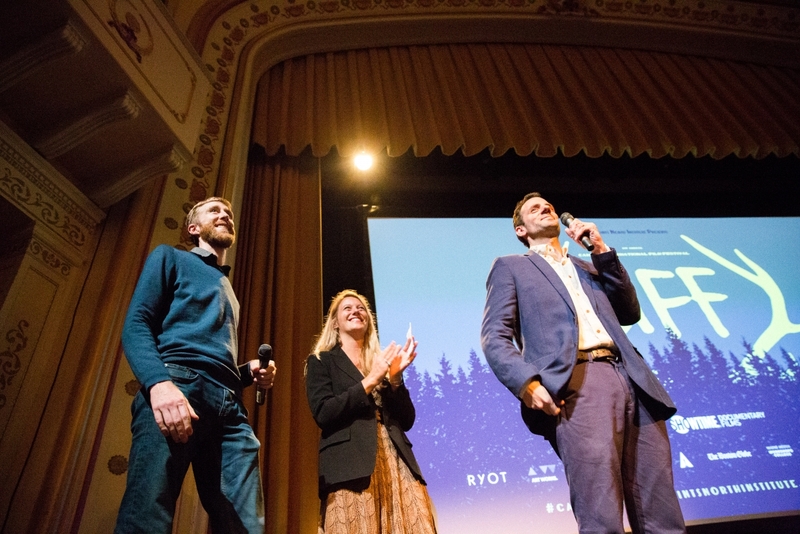 I was starting my second year of working at the Camden Conference when Ben Fowlie, now CIFF's executive director, first mentioned the idea of starting a documentary film festival in his hometown of Camden. I knew nothing about film festivals—or documentaries, for that matter—but I loved event production and I had the vital combination of a degree in entrepreneurship and the naiveté of youth. After the first CIFF, in 2005, I fell in love with both what we were creating and the documentary art form, and I've never looked back. I worked as part of the core CIFF team for the first six years, and served on the board of directors for the next six. These days, I experience the festival as an attendee. Each chapter in my CIFF experience has had its incredible merits, but there is nothing quite like the feeling of attending the festival as it truly hits its stride as a destination on the documentary circuit, with the perspective and appreciation for how far it has come, and how beautifully the core components that make it so special have been carefully nurtured and developed by the skilled team at the helm. It's a coming home of sorts—not just for me, but for all of the community members, filmmakers and new and established players in the documentary industry who have helped to create and sustain this community-driven event. Five Hours to Opening Screening: crab roll and grilled clams at McLoons with my mom, aunt and cousin. Afternoon sun sparkling off the bay, lobster boats coming in one by one unloading their catches and heading out to their moorings with checks in hand from the day's work. Three Hours to Opening Screening: deliciously cool swim in the ocean, floating among seaweed and flushing out a blue heron from my scramble down the rocks. One Hour to Opening Screening: over to the hub with my dad to check out the new CIFF merch, say hi, and pick up badges and programs for the weekend. Thirty Minutes Out: filing into the beautifully restored Camden Opera House, seeing so many familiar faces in line and waving quick hellos or stopping to catch up, and sitting down to local band The Tough Cats rocking the auditorium. The buzz in the room was electric. "Better than the strongest coffee!" my dad and I laughed. Opening night is one of my favorite moments of the festival; it gathers and centers everyone for the weekend to come. In the early days, we were happy when just the ground floor filled up. Now, there are secondary locations screening the film at a staggered start time to be able to accommodate everyone. As Fowlie, Program Director Sean Flynn and Senior Programmer Samara Grace Chadwick took the stage, the entire house could feel the significance of the moment to them—unveiling a program a year in the making, with the same outpouring of energy that had driven the festival since the beginning. Fowlie encouraged everyone to get the full CIFF experience by truly immersing themselves in the weekend. "Whatever's waiting for you, it'll be there Monday!" he urged with a smile. As a core part of CIFF, the Points North Forum dives into the craft and business of documentary. Flynn noted that these programs are designed for anyone curious to learn more about the form, not just for industry experts or professionals. He also highlighted the 40 filmmakers at the festival developing their works-in-progress, either as part of the Shortform Residency, Points North Fellowship, or other cohorts supporting Points North Institute's mission to be the "launching pad for the next generation of nonfiction storytellers." Chadwick showed an incredible sense of reverence for the deeply personal, creative and sometimes wrenching work of documentary filmmakers. She shared a powerful new trend showing up in this year's films: the way in which documentary illuminates not just the world around us, but the world within, for both the maker and the viewer. And then we were off, diving into the crazy world of film within film within film of Morgan Neville's They'll Love Me When I'm Dead, which follows the final 15 years of famed director Orson Welles' life and explores the incredible influence of power, and the never-ending insatiability of external validation. A perfect way to start the festival, in a community where the self-proclaimed worst question you can ask is, "So what are you working on now?" I wrapped up my first night at the VR installation ListenTree, hugging trees in Camden's village green to hear songs and prayers of the Wabanaki people, from Dawnland. The weekend that followed ebbed and flowed from the art and craft of documentary to immersion in story. This year marked the 10th year of the Points North Forum, and it has become a component intrinsically wound around and through the festival, each element informing the other and creating a richer, more nuanced experience. Almost every film has a filmmaker in attendance, and panels offer insight into filmmaker's styles, which shed light on their stories but also open up new layers of seeing all the work. Friday morning, for example, the first Shorts First program (a curated collection of shorts all linked through a focus on our relationship with water), culminated with The Last Storm, the story of two men hunting a tornado and then catching it in awestruck glory, inspiring thoughts of what we do to feel alive and the tremendous power that can come from learning to lean into our fear, physically and emotionally. In the panel that followed, filmmakers shared how their stories found them, and provided a behind-the-curtain glimpse into the world of filmmaking, forging a deeper connection between filmmaker and audience. Later that afternoon, at a Director's Commentary: Sound and Score, filmmakers Mike Palmieri and Donal Moser (The Gospel of Eureka) urged participants to trust the audience, not underestimate them. When it comes to sound design, for example, a song played once has a way of haunting the next scene, reverberating in the minds of the viewers without being played immediately again. There's an almost reverence that can arise from creating that kind of space that Palmieri and Mosher are masters of—space for reflection, feeling and integration. 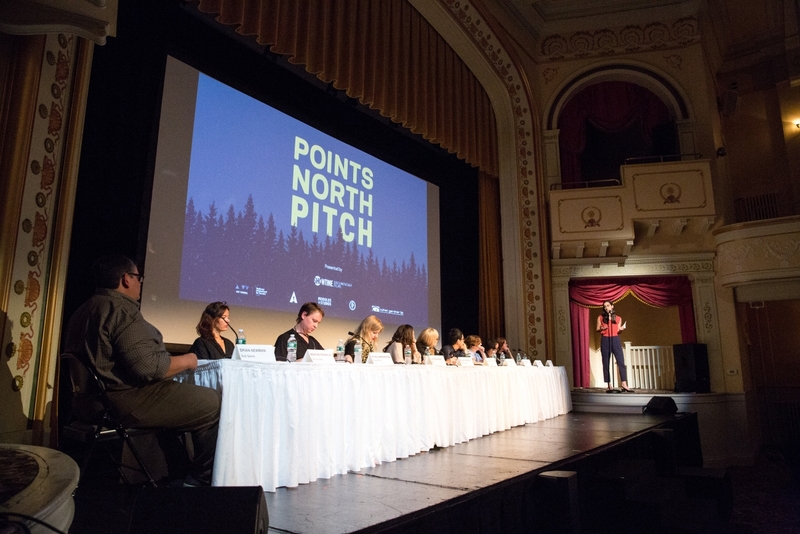 At the Points North Forum on Saturday morning, six teams of filmmakers bravely pitched their projects-in-development to a panel of funders and industry leaders. Though there was minimal constructive criticism from the panel, perhaps that spoke to the quality of the projects and the intensive coaching received behind the scenes during the festival. Each pitch had me full of emotion, and I was dying to know more. After the last pitch, Ryan Harrington, now executive producer of feature docs at Pulse Films, summed up just about everyone's thoughts, exclaiming, "The trailer game is really strong in Camden!" But that doesn't mean that the journey ahead for these filmmakers won't be without challenges, and the panel helped to shed light on those potential pitfalls. The panel shared the topics for which they were seeing a lot of pitches—the US/Mexico border, Standing Rock, climate change—and urged the filmmakers to share boldly what makes their projects unique or different— personal connection to the story, deep trust and immersion in the community, etc. They referenced similar films on topics to explore and cite in grant applications or conversations. And resoundingly, there was a feeling that the people telling the stories were just as important as the stories themselves. In response to the pitch for Landon Van Soest's Light Darkness Light, Field of Vision’s Charlotte Cook shared, "We support filmmakers as much as we support projects, so I love that you're talking about your journey as a filmmaker." And then there was the winning project, Joonam, directed by Sierra Urich, which seemed to bring all these layers together on screen: A search for identity across three generations of women—mother, daughter and grandmother—with lives progressively moving from Iran to America, and a filmmakers' quest to understand where she comes from as a way to understand herself. There can be a tendency when you're in an industry built around a creative product to lose sight of the magic of what you're developing, and transition into a transactional focus on the business of what needs to be done. For me, CIFF pulls that awareness continuously back into focus. Yes, there's a deep and rigorous awareness of the business of documentary, honing pitches and keeping up with the ways the industry is shifting how films are getting made, funded and seen. But we are here to learn more about ourselves and the worlds we have lived in and created. We're here to have the courage to tell the stories we're inspired to tell, to have faith in our voice, and to find ourselves in dark theaters before beautiful, soulful films. And then it was over as quickly as it started. We have all returned to our various professions, homes and places in the world, but in ways subtle and not so, we remain connected by the shared experience. The perspective shifts from time in theaters, meeting rooms, sidewalks and courtyards, reflecting on the world and our place within it. A sense of community and nurtured interest in genuine understanding and connection is needed now more than ever. Leah Hurley is an entrepreneur with a focus on content production, communication strategy, and social innovation through her agency Craft (crafttomorrow.com). She grew up in Belfast and lives in Portland.